When you first bring your puppy home, it's always one of the most exciting times. But please remember that this is a new place for your puppy, and can be a scary experience for your puppy just as much as it is an exciting time for you. You need to keep in mind when picking out your puppy, that you pick a puppy with a temperament that matches your household, and those in it. In a littler of puppies there is going to be ones that are bolder than others, some that are more independent, some that are busier and some more reserved, some that like the retrieve things. There are all kinds of personalities and this is certainly something you should take into account and should spend some time with each puppy to get to know what kind of personality they have have how well it would fit into your home and lifestyle. Remember, this is a lifelong decision and one you want to make wisely and not rush into or get carried away with the new excitement of bringing home a new puppy. When you first bring your puppy home the first thing you want to do is to start bonding with your puppy. Be the center of his/her world, play with him/her, feed him/her, take a nap with him/her, etc. Be the one and constant thing in his/her life in this new "place". Limit the interactions between the other animals and family members in the home, to ensure that the bond between you and the puppy will be a strong and constant bond. One that builds trust, loyalty, and feeling protected. 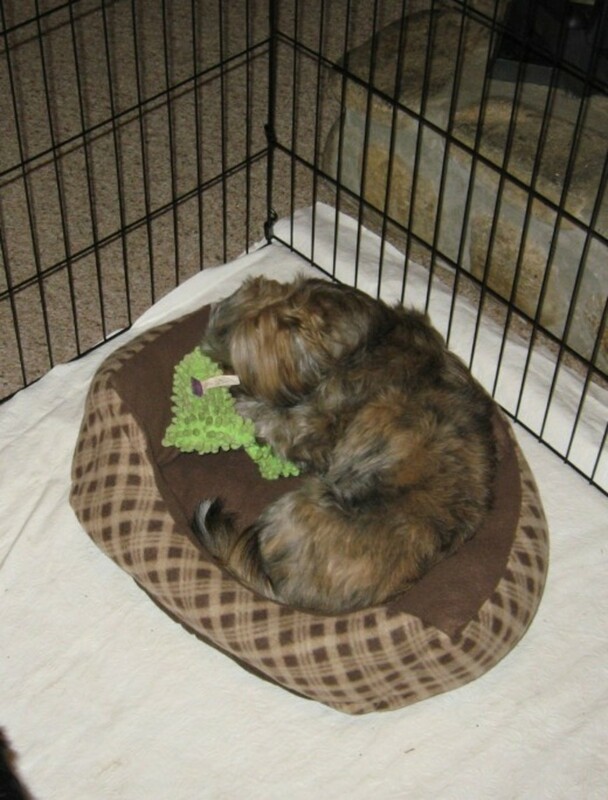 If you can't always be with the puppy make sure to place him in a good size crate or safely in another room away from the other animals, kids, and older family members, unless someone can watch him for you for a few hours. 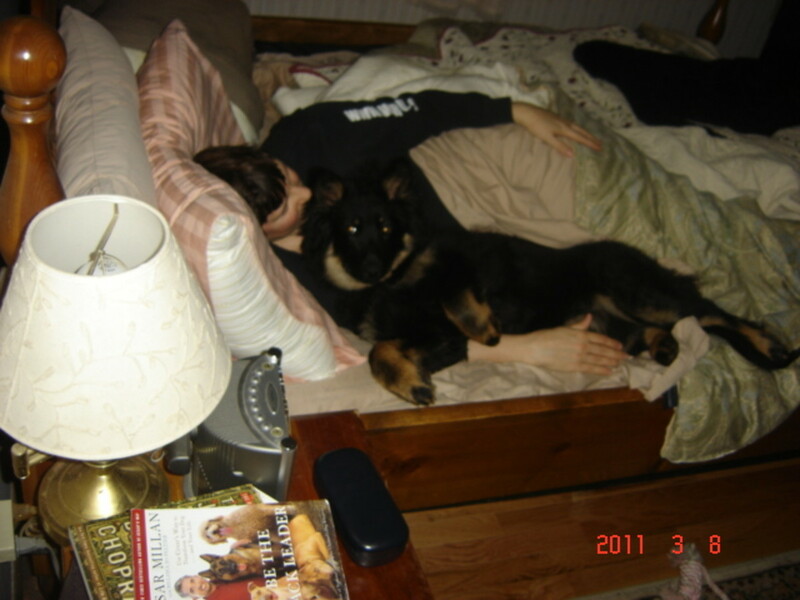 No older dog wants to babysit a little puppy and can easily get annoyed with the constant tugging and biting. And kids are not old enough to know how to gently and correctly watch and take care of a puppy, so make sure you have someone who understands about puppies, or place the puppy in another room safely, by placing him/her in something like a crate or over sized box or plastic pool with some newspaper laid down and some toys. At 8 weeks of age your puppy is old enough to start learning tricks that will help you in the future with obedience. Now is a good time to start teaching those wanted behaviors to your puppy through fun games with a good motivator like a treat as a reward. Dogs are problem solvers and so they need to "work", giving them a good command gives them the work they desire and also helps you with bonding with your puppy and teaching the wanted behaviors your going to want from him/her later on in life after he/she grows up into an adult. Commands like, sit, stay, come, down, stop, wait, kennel, etc. are good commands to start with, as these are commands you can easily start using right away with your puppy as you move around the house, or take them outside or start introducing the lead and walk to them. 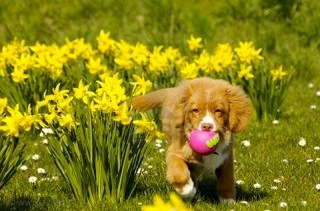 More advance commands, like those in a field, can come later after the puppy has matured more for such commands. Start easy, remember, they are learning a new language, they were not born understanding human, only dog. So introduce the new language to them slowly & have patience. Teaching your puppy to roll-over…it's entertaining. It doesn’t matter too much on what you teach your puppy at this point, as long as your puppy is learning the wanted behavior which will elicit a reward from you and therefore is a positive reinforcement in the right direction for the behaviors you want. Also, as you are watching your puppy grow up in this stage, you can train your puppy and modify his natural behaviors as well. 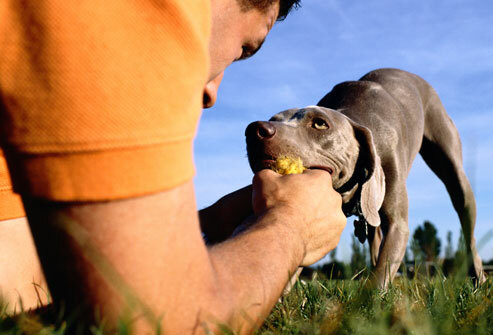 By ignoring the bad behaviors, and rewarding the good behaviors by a touch/pet or a favorite toy or treat when he/she does the desired behavior you want. This will teach your puppy that if they do a certain behavior they get a reward for it, and will encourage them to do this behavior more. This is another good thing to start doing in this early stage. Once you get your puppy on a command and reward "schedule" you'll want to teach your puppy that it is just as important to move away from what he wants to get and wait for your command as it is to get what he wants. Although luring your puppy is a great way to start, the sooner your puppy learns that sometimes his behavior will take him further from the reward, and that with obedience he will get the reward he wants, the better off you will be in further training. 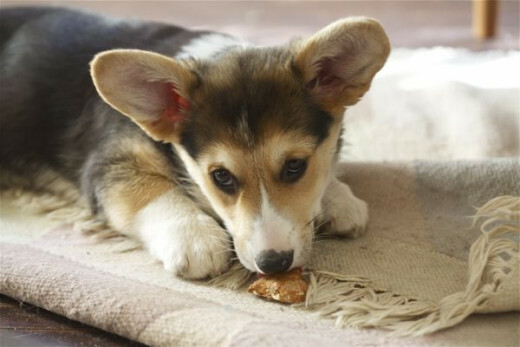 To introduce this concept you give your puppy a task to do, (that he already knows well) and then give a final command like, "good boy" or "Ok" after the wanted command, to let your puppy know he/she did a great job in completing the task or command, then you can go ahead and give the treat. If he doesn't do the command correctly or complete it, no treat. Wait a few seconds and try again, he doesn't get the treat until he does and command completely. You could also use a clicker if you preferred as well. 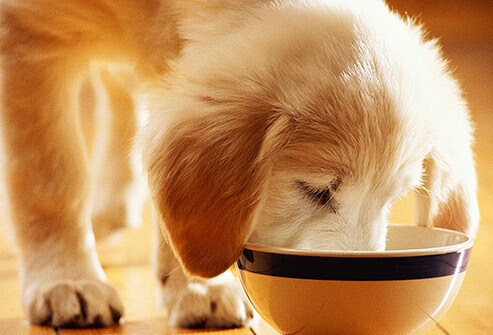 When feeding your dog, always start with a little bit of what the breeder has been feeding your puppy, and then try switching over, (if staying on the food brand is not an option or preference) to something high quality and easy enough for your puppy to eat (pieces that are not to big), and mix this new food in with the old food for about a few weeks, allowing your puppies stomach to change over to the new food. You want something rich in the needed puppy fats and proteins, so make sure you talk with your vet and consider the dog breed when you go pick out a new food source of dry high quality dog food for your little puppy. If you invest in a good quality food, it should not be necessary to give supplements to your puppy or vitamins. Discuss this with your veterinarian which brand would be the best upon your first puppy visit/exam. A seven to nine week old puppy will be happy to eat three times a day. It will be easier to housebreak him if he eats on a schedule, so offer him some food, and when he loses interest and wanders away, pick it up and save it for the next meal. And watch him for the next 20 minutes, as usually a puppy will have to go to the bathroom 20-30 minutes after he eats his meal at this age. Keep in mind that as your puppy grows, the amount of food you feed him/her will be changing every few weeks, so measure your food and follow the measure scale on the side of the dry food bag, but make it a habit to look at him and feel his ribs so that you are ready to make changes as he grows. If you are still confused as to how much to feed him, go ahead and call your vet and discuss it with your doctor. You don't want to underfeed, and you don't want to overfeed. Again, keep in mind that after the puppy plays, eats, or/ sleeps, these are the times after each one that you need to take your puppy outside for a break. About 20-30 minutes after he/she eats he/she will have to go to the bathroom. So make sure to keep an eye on them. If you see he/she is circling, or losing interest in the activity they are doing, and searching elsewhere, it's time to take them out to go the bathroom. It’s important for your puppy to explore his/her new surroundings so let him/her look around, but remember, to always keep an eye on your puppy. A dog is a den animal by nature and instinctively does not want to go to the bathroom where they live. Unfortunately, most of us live in homes that are so big that the dog does not equate our entire house with his den. Therefore, it is important to keep any dog, and especially a puppy that is not housebroken, with you in the room and close by. If you let him leave the room, he will equate this with leaving the den, and think it is acceptable to go to the bathroom. And will not understand that this is still part of the home. So, as you let him explore, keep him in the room you are in. If you are in the bedroom, shut the bedroom door. If you go to the kitchen, take him with you. If it is not possible to shut a door, put up a wooden or plastic baby gate or pet gate. These days you can easily get a gate to match almost any entryway possible. You can easily find on online at petco, petsmart, or ebay, or cragislist for a good price. Even Amazon has good choices. 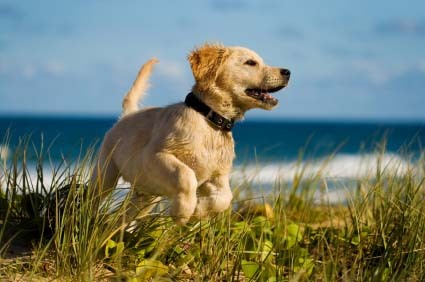 Every time your puppy changes activities, he should be taken outside. If he wakes up, take him out; stops playing, out he goes; stops eating, out again. Take him out before the accident occurs. This will help him/her understand that outside is where he is supposed to go, not inside. If you have a particular place in the yard that you would like your puppy to go to the bathroom, begin by carrying him to that location and then setting him down. Don’t try to walk him there. At this age, there’s a good chance it’s too far for him to travel before he stops to relieve himself. Remember, his/her bladder is only a small acorn. He/she can't hold too much for too long. So keep this into consideration when you take your puppy outside. It will be a few more weeks before he/she can possible walk a few steps before going. If your puppy does have a housebreaking accident right in front of you, make an exclamation of disgust and take him outside (“No” is sufficient). It is not necessary to drag him to the mess or to rub his nose in it. If your puppy goes to the bathroom in the house while you are not watching, there is absolutely nothing that you can do to correct him. Why? Dogs do not remember and feel responsible for actions in the past, he simply won't remember it. When playing with your puppy, this is a good time to introduce tug-a-war and issuing the "drop" command, the stay command and the sit command, for example, before you throw the ball ask for your puppy to sit before getting the ball, this is another good time to introduce the "fetch" command. As you play with your puppy, issue the wanted commands, and modify the wanted behaviors discouraging unwanted behaviors like chewing. A small puppy comes to your home having learned to play with his litter mates by chewing on them. Your puppy is going to chew on you. 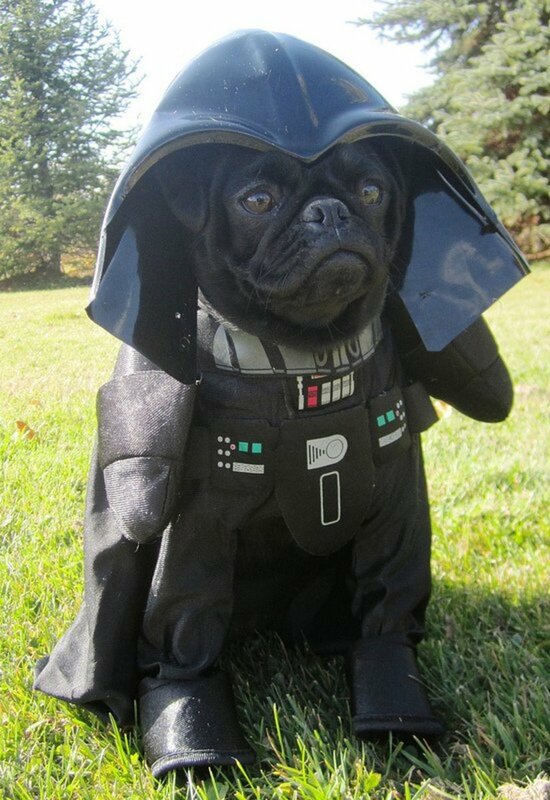 It is inevitable and it does not mean that he is a bad puppy. To stop this unwanted behavior make an exclamation of pain and give him a shake. When you do this you are mimicking what his litter mates did when he bit them too hard, you are biting him back, it doesn’t matter where you grab him. Young puppies have a lot of loose skin and you can grab him anywhere as you let him know that he hurt you. He should back away and look startled at your response. Your correction should be quick, and then it’s over and you can continue playing with him as you were before he bit you. If you have a young child that you fear your puppy will hurt, encourage your child to play with the puppy with a toy so that the puppy has something to focus on besides the child’s clothes or hands. And encourage the child to not place his/her hands towards the puppy in a playful manner, and to not "tease" the puppy with these objects. This will only further encourage the puppy to bite. It is also inevitable that your young puppy will want to chew on anything else that is at his eye level. 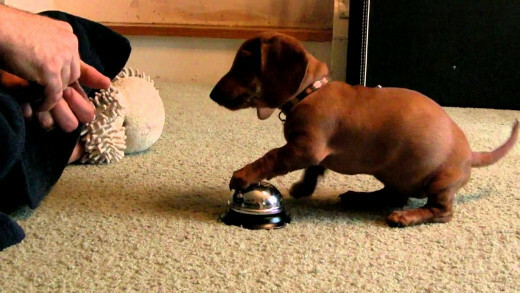 When he does, simply remove the object, or move your puppy, and give him a toy of his own. This will reinforce the behavior that you want vs. the behavior you do not want your puppy to display. At this age you are wasting your time by scolding him, he is simply too young to care or to understand what your displeasure is about. Wait a few more weeks before you start scolding, when he can remember and when he cares enough to be scolded. After a few weeks to one month, you will need to introduce your new puppy to the rest of the family, it should be after you have bonded with the puppy and he feels safe and assure of your presence. If you already have a dog or a young child, don’t be in a hurry to introduce your puppy to your dog or child. This can happen gradually over the next few weeks or even months. Just let your puppy explore and get to know the smells and natural sounds of your household. Experience the natural activities of your home. A seven to nine-week-old puppy of any breed is so small that it can be hurt by an older dog, even in play or with a child who most likely doesn't understand how to interact. This is the time to teach your young child how he/she should pet, hold and play with the puppy. 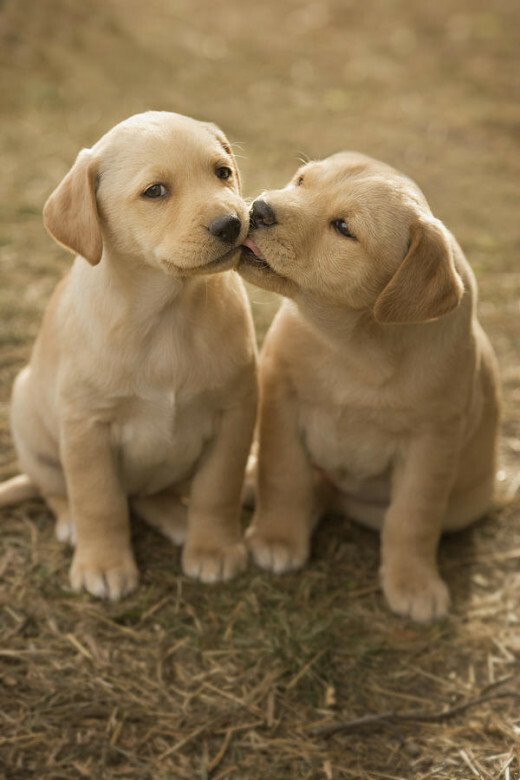 Furthermore, if your older dog decides to discipline the puppy, there is a good chance the puppy can be seriously hurt. Let your older dog get to know the puppy by visiting with one another through a baby gate or crate. You have a whole lifetime to let them grow accustomed to one another. It doesn’t need to happen in the first few days. After a few weeks to a month, try introducing them together in the same room, but keep a close eye on them for the next few months. And try keeping your puppy entertained so the other dog doesn't become the babysitter. This will enforce the bond between you and the puppy, vs the bond the puppy would have with the other dog over you. And will help when you start giving the puppy commands. He will WANT to listen to you if he has bonded with you, vs another dog. Upon bringing your puppy home, you will need to schdule your first visit to the vet. Here below I have listed a few links that will help you know what type of questions you can ask your vet upon your first puppy visit. Your puppy needs a series of “puppy shots” that start when he is six weeks old and end when he is four months old and able to have his first Rabies vaccine. Even if your puppy has already had his first vaccine, call your veterinarian as soon as you get him home and find out when he wants you to bring him in for his first visit. Then, be sure to follow his guidelines for his needed boosters. Also, be sure you ask as many questions you feel you need to. 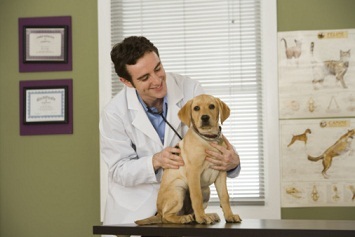 When you are at the vet, that is the is the time to come with all your questions and concerns about your puppy. If it's about how much you should feed, or what brand is the best, to behaviors your not sure about, even introducing him to your family, or if your having a problem if figure out how to do these things with your puppy on a crazy schedule, or if this is your very first puppy and you just have no idea what to expect, they can certainly tell you. These are all things you can talk with your vet about and they can help you find a suitable solution to your problem. If not, they can always direct you in a good solid direction. Be sure to come with all your concerns and questions, after all, it's better to be safe than sorry. Here are routine questions to ask your veterinarian when visiting for the first time with your pet. Chodsky Pes Where the heck do I find one?